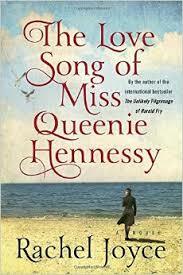 a book chick: "The Love Song of Miss Queenie Hennessy"
"The Love Song of Miss Queenie Hennessy"
If you read and loved The Unlikely Pilgrimage of Harold Fry, you are in for a treat. If you haven't read Harold Fry: go. do. that. You are in for a double treat. This is the lovely companion to Harold's story. In fact, now I want to go back and re-read to cross reference and see if I caught all the bits and clues Queenie reveals. If you like the show Derek I think you will get a kick out of this as it's set in a hospice home staffed with quirky nuns and the final stop for a delightful group of wacky patients. "....All these years I thought a piece of me was missing. But it was there all along....It has been everywhere, my happiness--when my mother sang a song for me to dance, when my father took my hand to keep me safe--but it was such a small, plain thing that I mistook it for something ordinary and failed to see. We expect our happiness to come with a sign and bells, but it doesn't...."
Funny (I laughed), touching (I cried), and philosophical (I came away a better person). my source: well-recommended by Daughter Anne and definitely worth the hardcover purchase at Schuler Books - if you are in West Michigan stop by to borrow. Oh, I didn't know you had read this one yet! I really thought it was even better than Harold, and I liked that it made me think of Derek too. I've been going around recommending it, but it's tricky because it really means people need to read two... it's even better for having read Harold first.